The fantasy football waiver wire can often make or break your season. Making the right decision on which players to add and drop is crucial, so we have you set up with a deep list of potential waiver wire adds for Week 12. Lamar Jackson, BAL (10-20%) — Joe Flacco could return soon, but Jackson’s massive upside with his legs puts him into the premium streamer conversation this week. Jameis Winston, TB (10-20%) — Winston could be the top quarterback add of the week, but we’ve been down this road with him before and know that he could lose his job at any minute. Gus Edwards, BAL (15-30%) — One of this year’s most unlikely fantasy breakouts, Edwards appears to be in line for more work in the Ravens offense. Peyton Barber, TB (15-30%) — He’s coming off a 100-yard game and is locked in as the Bucs No. 1 back. D.J. Moore, CAR (50-100%) — Moore exploded in Week 11 and by far the top waiver add of the week. 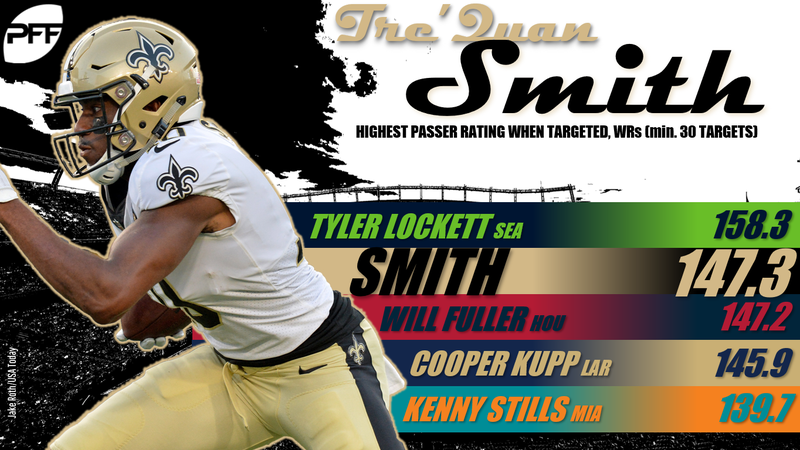 Tre’Quan Smith, NO (25-50%) — Hopefully you didn’t drop him after his Week 10 stinker. Smith is in the WR3 conversation after his massive performance against the Eagles. Keke Coutee, HOU (20-40%) — Coutee returned from injury and appears to be clearly ahead of Demaryius Thomas in the target pecking order. Vance McDonald, PIT (10-20%) — If you’re hard up at tight end, McDonald is likely your best bet on waivers this week. Eli Manning, NYG (5-10%) — He’s trending up down the stretch and gets a favorable matchup against a banged-up Eagles defense. Baker Mayfield, CLV (5-10%) — Mayfield tossed three scores before the Browns bye and draws a nice matchup this week against the Bengals. Josh Adams, PHI (10-20%) — He only saw seven carries, but Adams was clearly been the Eagles best running back in Week 11 and has been over the last month. Theo Riddick, DET (10-20%) — With Kerryon Johnson banged up, look for Riddick’s role to expand this week. Jalen Richard, OAK (7-15%) — Doug Martin is dinged up, so Richard’s role could expand this week. Elijah McGuire, NYJ (5-10%) — He’s out-snapped Isaiah Crowell in each of the last two games and offers upside for the stretch run. Spencer Ware, KC (5-10%) — It’s handcuffing season, and Ware offers premium upside if something happened to Kareem Hunt. Malcolm Brown, LAR (5-10%) — Brown is Todd Gurley‘s handcuff and would become and instant RB1 if Gurley went down. Anthony Miller, CHI (10-20%) — Miller found the end zone again last week, but his target volume could be somewhat capped as the No. 3 receiver in the Bears’ offense. Christian Kirk, ARZ (5-10%) — The rookie is trending up after flashed upside with a touchdown and 77 receiving yards in Week 11. Adam Humphries, TB (5-10%) — Humphries continues to be a productive option out of the slot for the Bucs. Curtis Samuel, CAR (5-10%) — Samuel only played 16 snaps in Week 11, but he saw a massive eight targets in the game. Expect his role to increase. Dontrelle Inman, IND (3-5%) — Andrew Luck has taken a liking to Inman, as the receiver found the end zone last week. Jonnu Smith, TEN (5-10%) — Smith has scored in two of his last three games and caught six balls last week. Jeff Heuerman, DEN (3-5%) — Heuerman didn’t rack up 10 catches again this past week, but he did remain a prominent part of the Broncos offense. Josh Allen, BUF (1%) — Allen could return to the field this week, which puts him back on the deep-league radar. Colt McCoy, WAS (1%) — With Alex Smith out for the season, McCoy is now in play in 2QB leagues. Jaylen Samuels, PIT (3-5%) — Samuels has emerged as the primary handcuff to James Conner. LeGarrette Blount, DET (3-5%) — Blount should see an expanded role with Kerryon Johnson likely sidelined on Thanksgiving. Jordan Wilkins, IND (1%) — He flashed upside with a touchdown in Week 11 and would benefit if Marlon Mack got injured. Bruce Ellington, DET (1-3%) — The Lions started Ellington last week and the journeyman racked up nine targets in the process. Marcell Ateman, OAK (1%) — With the Raiders extremely thin at wide receiver, Ateman should see an increased workload down the stretch. 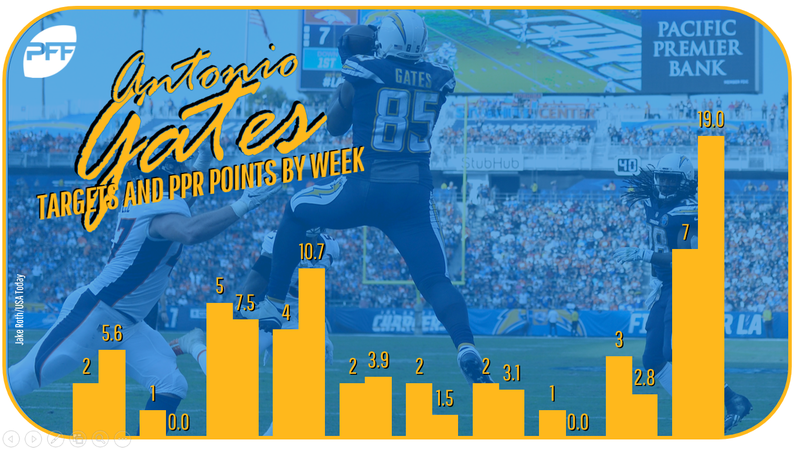 Antonio Gates, LAC (1-3%) — Gates showed flashes of 2005 this past week with five catches for 80 yards and a score, but keep in mind that he had been almost non-existent this season. Dallas Cowboys (1%) — The Cowboys are in play as a streamer option this week with a favorable matchup on tap against a Redskins offense that will be forced to start Colt McCoy at quarterback. San Francisco 49ers (1%) — It doesn’t matter who’s under center for the Bucs. Any week could be a monster performance for the opposing defense. Tampa Bay has surrendered at least two interceptions in every game since Week 3. Buffalo Bills (1%) — Buffalo’s defense has flown under the radar this season, but they’re pretty darn good. And so is this matchup against a Jags offense that yielded six sacks to the Steelers last week.